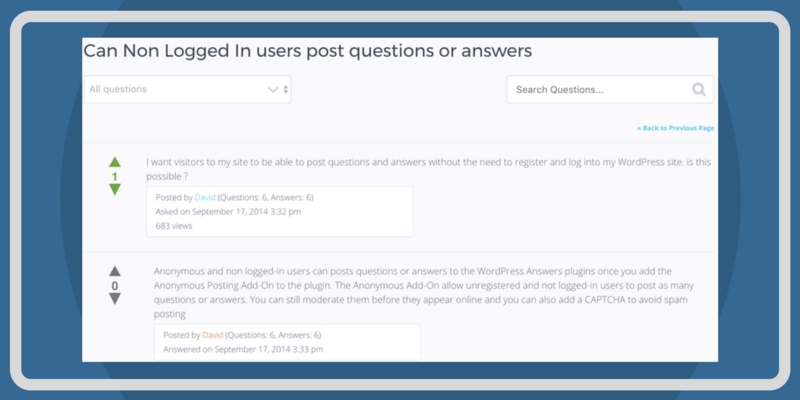 This Q&A plugin lets you build a community discussion forum or knowledge base on your WordPress site. Users post questions, answers, comments, and vote on best answers. 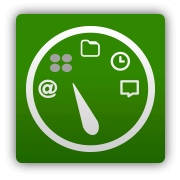 Advanced functionalities include multiple forums, file attachments, moderation, notifications, access control, payment support, and much more. Would you like to build a community website like Stackoverflow, Yahoo Answers or Quora on your WordPress site? 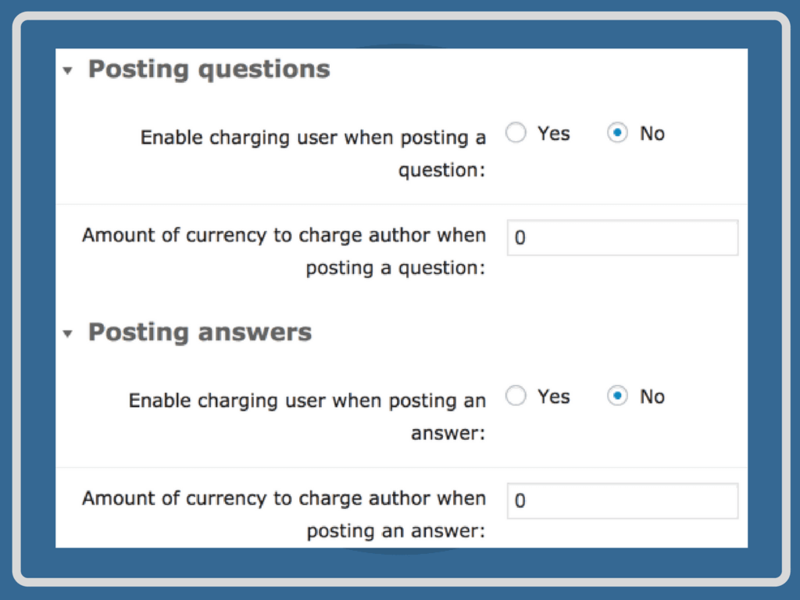 The WordPress Q&A Forum plugin gives you an easy way to build topic specific discussion boards or knowledge base, complete with user profiles, voting, and much more. 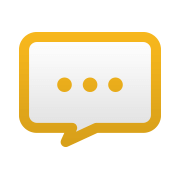 This Question and Answer system lets forum members ask questions to their community. Users post answers to questions, upload files, comment on existing topics, and vote for the best answers, depending on their user access. 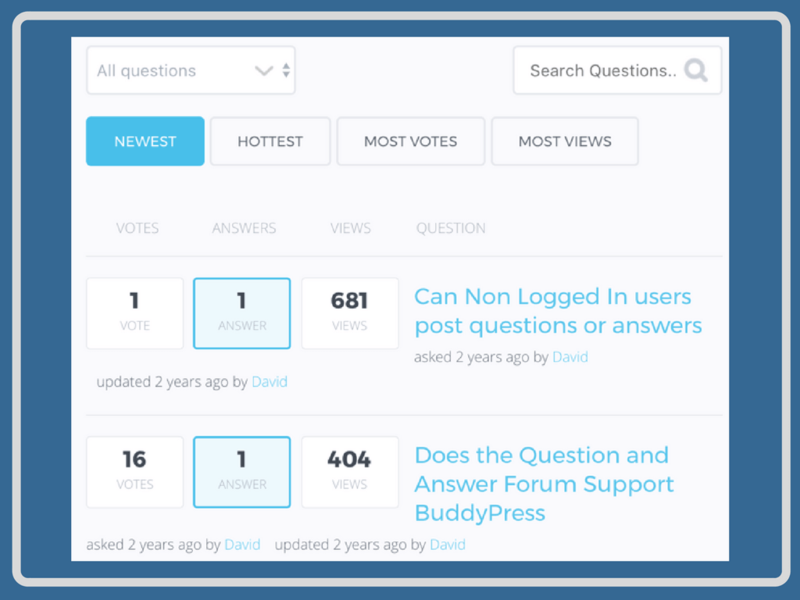 Users can quickly locate the right question or browse the forum by searching by keyword, or filtering by the most recent or most popular threads. 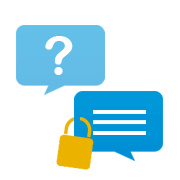 Each question receives its own thread page with answers, comments, images, attachments and the user information associated with each, if available. 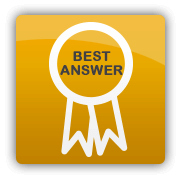 Users vote for the best answer, so other users can quickly spot the most popular question and answer. The admin can mark questions as resolved once a question receives sufficient answers, or is old enough to be archived. @pparnham from WordPress.org: "Sophisticated plugin with fantastic support - I, for one, am now sold on the idea that CM Answers is the most sophisticated option out there with a support team that truly goes the extra mile. Thank you." 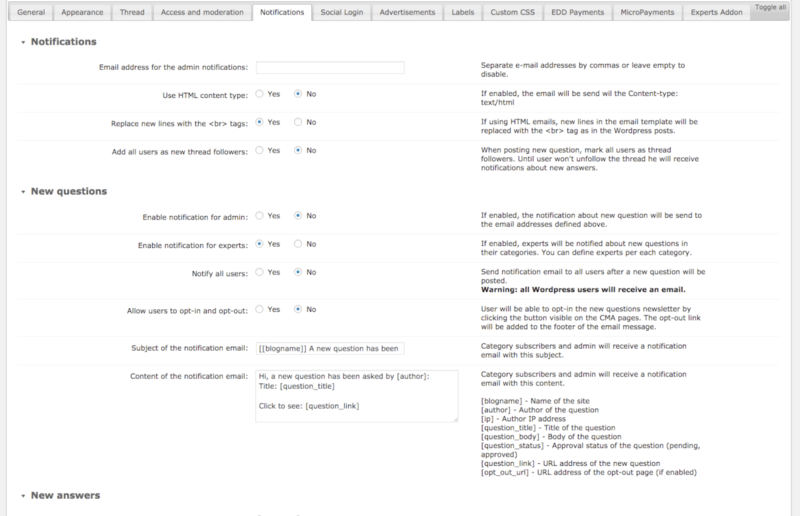 The Q&A Forum plugin lets administrators have significant control over actions performed on the forum, by topic and user. 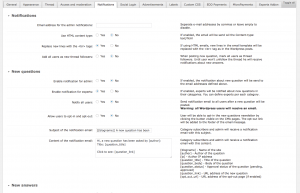 The admin can moderate what questions can be asked, which answers can be posted, what topics or negative language can be limited, with notifications and user specific access restriction capabilities. 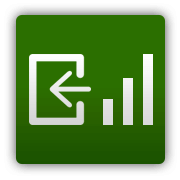 Our built in log & statistics module enables easy tracking of actions performed on the questions and answers system so that you're always informed of what's going on in your community forum. 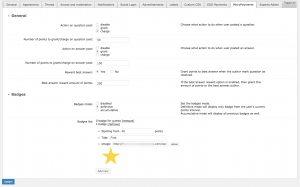 The WordPress forum plugin lets the admin filter content, customize the display of the forum in many ways and create multiple forums on the same site using specific categories. 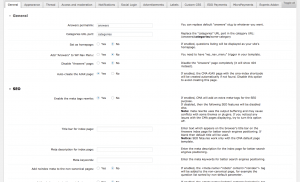 @owp2012 from WordPress.org: "Great customer support, Great plugin! - I got fantastic customer service, and great turnaround on a small issue that I had. Sorted quickly and professionally. Exactly within 24hrs as stated on the support page. Keep up the good work!." 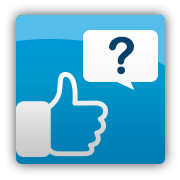 With this complete Question and Answer system, users enjoy a wide spectrum of options such as multiple file uploads, social media login, user profiles, private messages, and user voting. 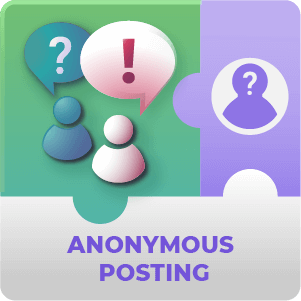 User can post private messages to other users on the forum and subscribe to categories or specific topics to receive notifications when new content has been posted on the forum. 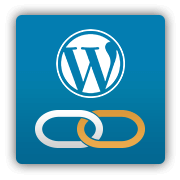 The WordPress discussion plugin can be integrated with several other WordPress plugins including the MicroPayments Platform which adds a virtual currency layer to require users to pay when asking or answering questions. 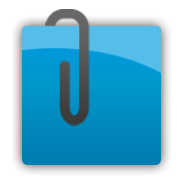 It can also be integrated with Easy Digital Downloads or WooCommerce cart systems. 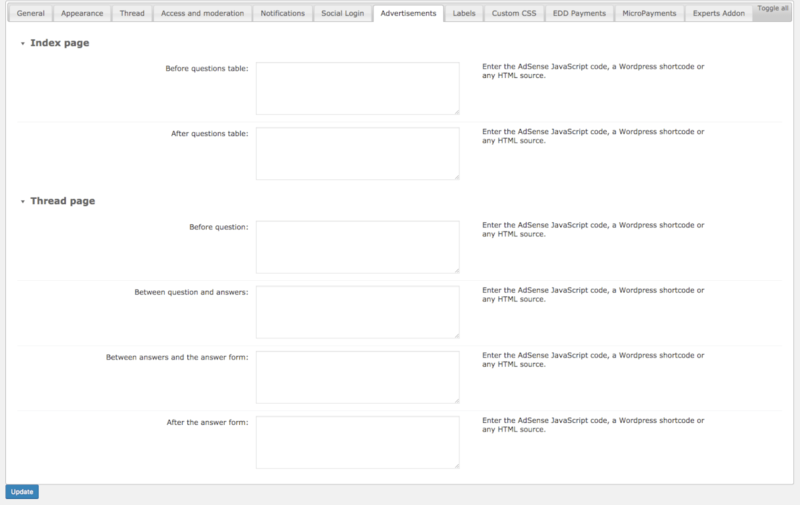 The Answers Plugin for WordPress can also be integrated with the EDD (Easy Digital Downloads) or WooCommerce cart system and support user payment requirement before submitting a question or answer. Paul Douglas, Developer, Douglas Web Designs: "Great Customer Service - Quickly replying to my emails with courteous and helpful replies led me to leave this review. 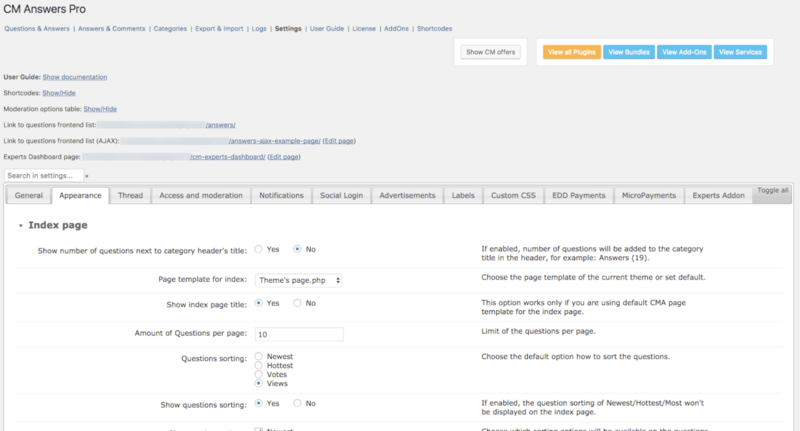 The plugin also has a great amount of useful options to meet the needs of any Q&A forum." 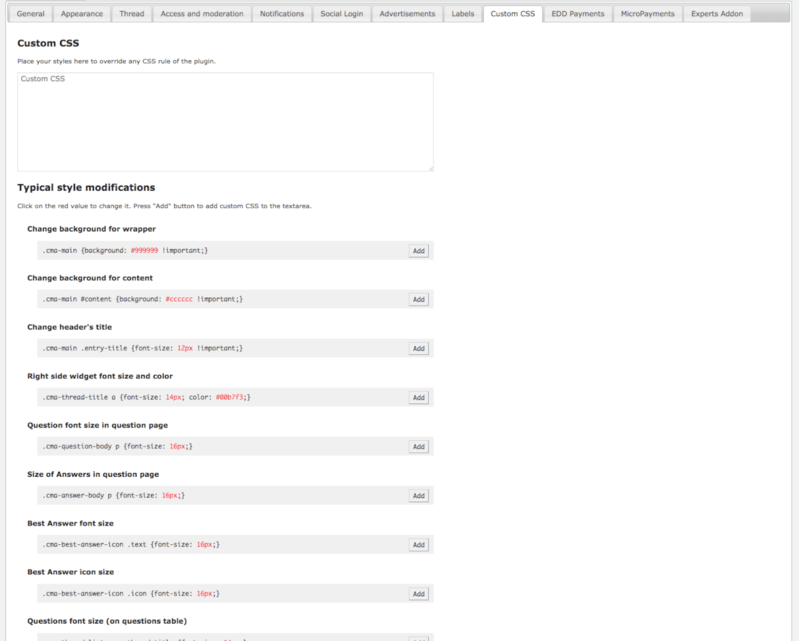 We already have PO/MO files for many languages covering the plugin frontend interaction. 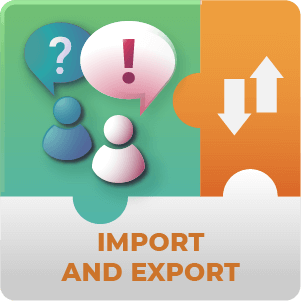 Supported languages include: Spanish, Polish, German, Danish, French, Italian, Russian, Czech, Dutch, Portuguese, Swedish. 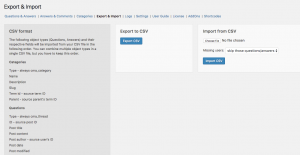 We will be happy to assist building other PO/MO files upon user request. 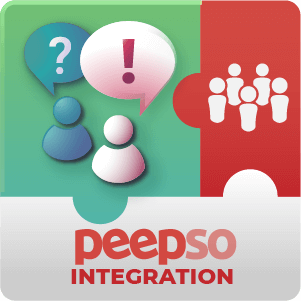 Robust Forum System – Integrate a comprehensive Q&A forum inside your existing WordPress site. 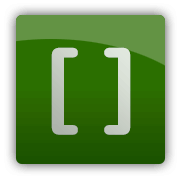 Versatile Shortcodes – Use shortcode to place the forum anywhere on your posts or pages. 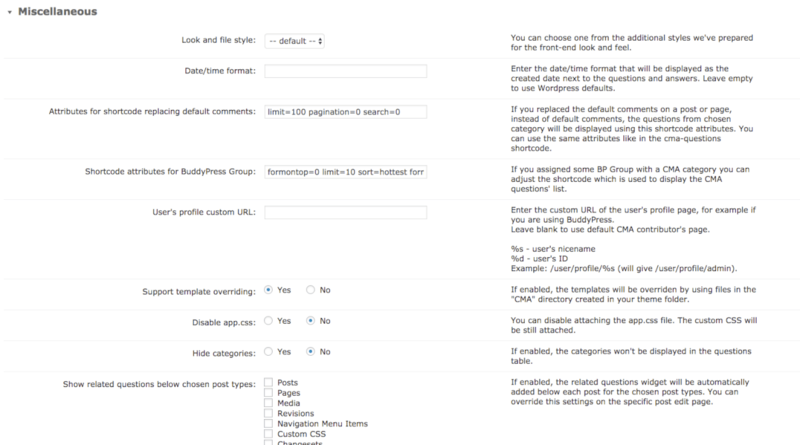 Replace WordPress Comments – Replace the built in WordPress comments system on any given post. 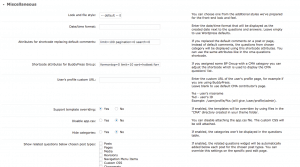 Multiple Forums – Use categories to create multiple forums on your WordPress site. 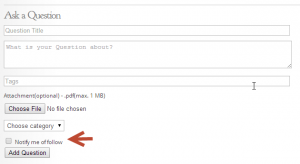 On Page Navigation – Use Ajax browsing mode to keep users on the same page while using the forum. 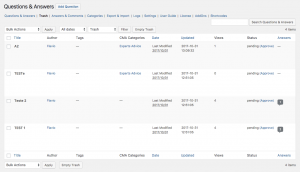 Powerful Forum Search – Users can query within the forum history and filter discussion boards to quickly find the answer they need. 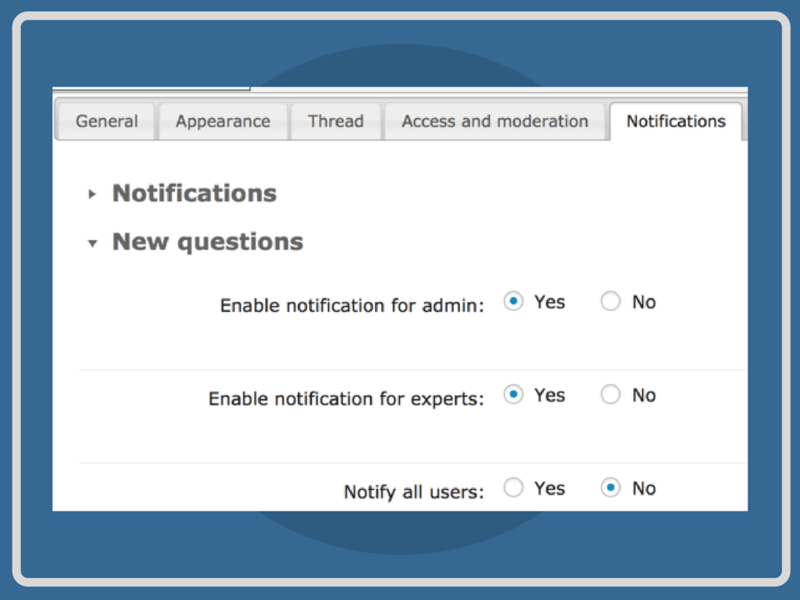 Forum Notifications – Keep your users notified on Q&A threads they are following. 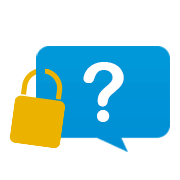 Forum Access – Decide who can view each forum, who can ask questions, or who can answer questions with detailed plugin access controls. 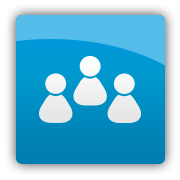 Forum Moderation – Powerful moderation tools allow the admin to limit allowable content or restrict postings with offensive language. 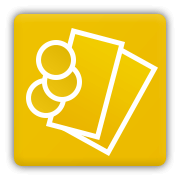 Forum Points System and Badges – Reward users with points and badges for posting questions or answers on your forum. 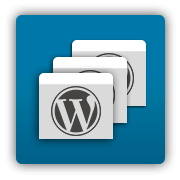 Multisite Compatible – This WordPress plugin is multisite compatible under the following conditions: (1) Each site needs to have its own unique license. (2) Data is not shared across sites. 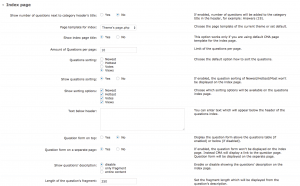 Most Views – Users can see the popular questions under the ”most views” tab. Access Control – With this complete Question & Answer system administrators can control who is allowed to view or post queries and which users are allowed to respond. Also control access to categories by role. 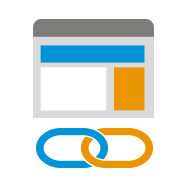 Ads Integration – Supports showing ads and banners inside forum. 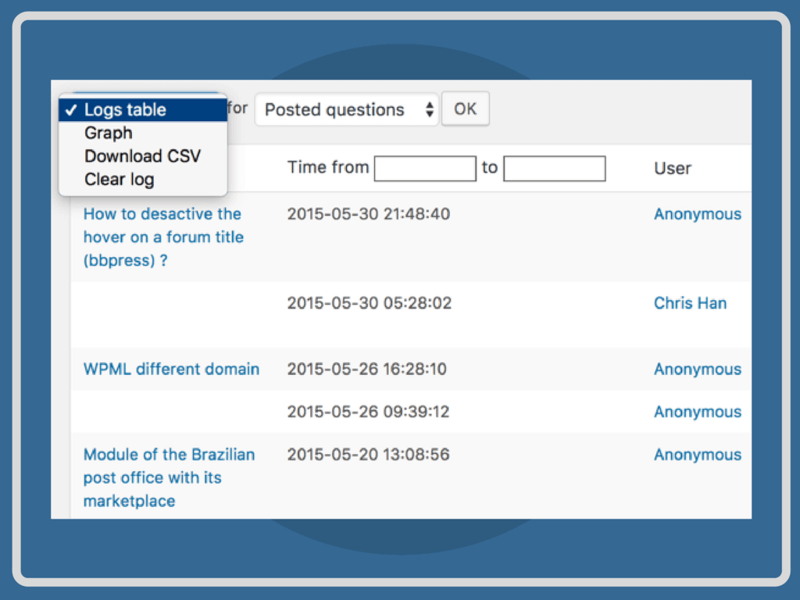 Attachments – With the CM Answers plugin, Users can upload file attachments to their questions or answers. 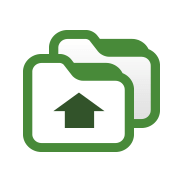 Admins can restrict certain file extensions. 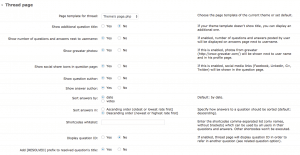 Voting and Best Answer – Allow users to vote for a questions or answers and question authors can select the best answer out of all the responses submitted to their question. 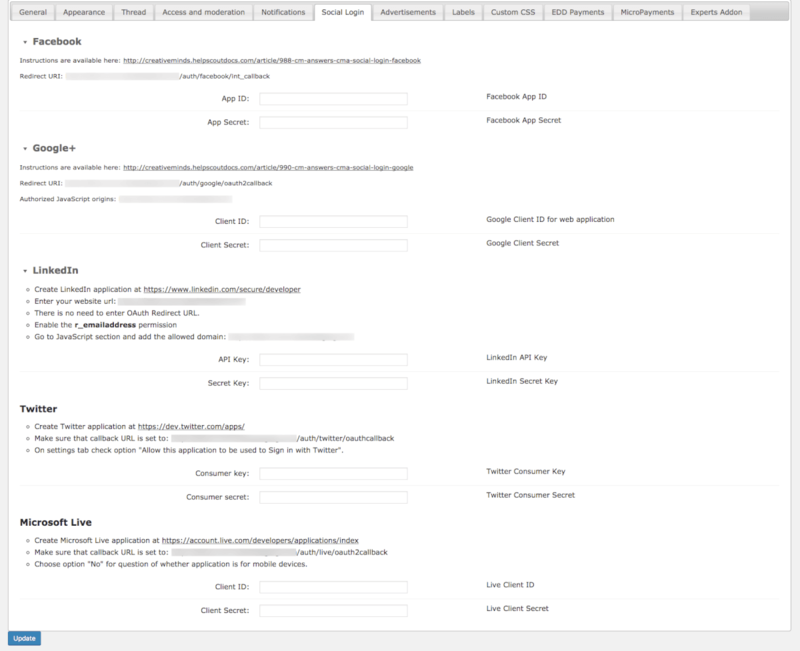 BuddyPress – Integrates with BuddyPress API. 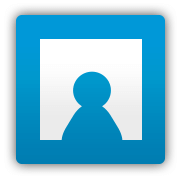 Shows posts by users that login with their BP profile. 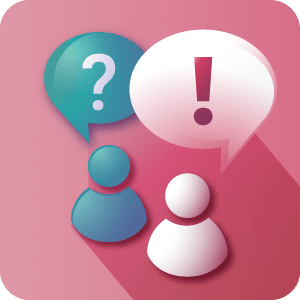 Comments – Comments can be added for each question or answer. 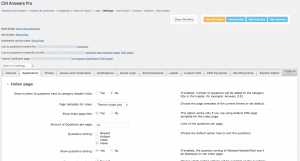 Customization – Easily customize the style and appearance of your Q&A discussion forum. 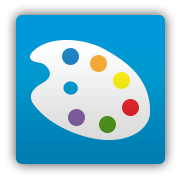 Style forums by changing the color of your choice and much more. 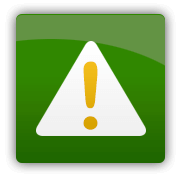 Disclaimer – Include a disclaimer that asks users to agree to your terms when they visit your forum for the first time. 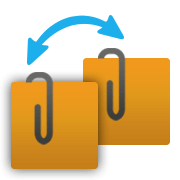 Drag & Drop – Drag & Drop files to attach them to posts. 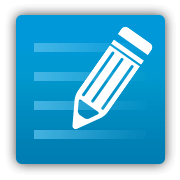 Edit After Posting – Authors can be allowed to edit their questions and answers even after they’ve submitted their posts. 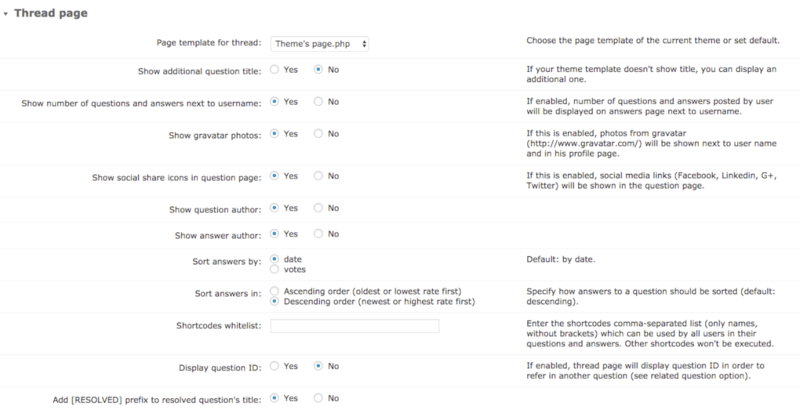 Favorite Question – Voting can be enabled for users to pick their favorite questions. 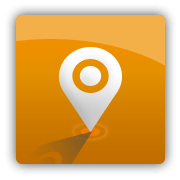 Geo-location Information – Shows the geographic location so you can see where your users are coming from. 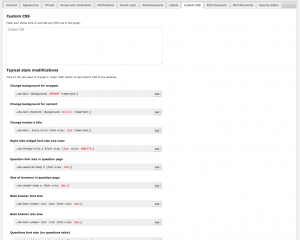 Localization – This plugin is translatable. It provides multilingual support including RTL language support (right to left). 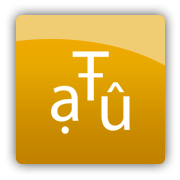 Supports UTF-8 characters for translation into a variety of different languages. 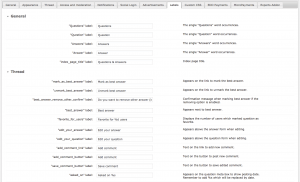 Logs & Statistics – Generates a detailed log and statistics of the forum activity. 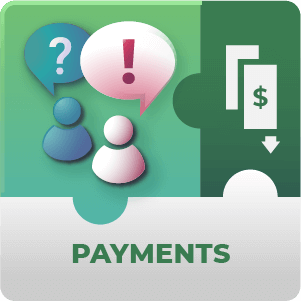 MicroPayment – Support within CM Answers for micro-payments to users that post answers. 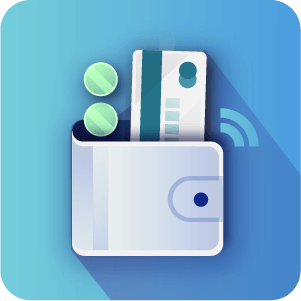 Badges – When using the Micropayments plugin display the users’ badges depending on their points balance. 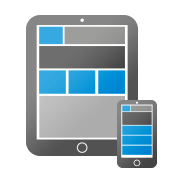 Mobile Responsive – Plugin is Mobile friendly. 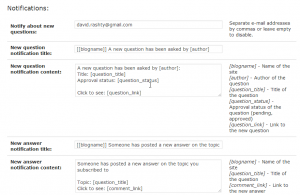 Moderation – Moderate user posts in your discussion forum like you would moderate WP spam. 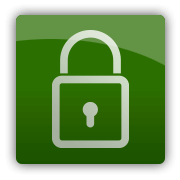 Restrict access or allow auto-approvals to specific users. 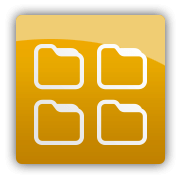 Multiple File Uploads – Support multiple file uploads on your discussion forum. 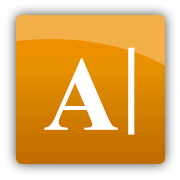 Notifications – Advanced email notification system allows authors to receive notifications when answers to their questions are posted. 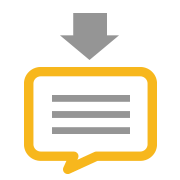 Users can track discussions on specific topics based on the category. 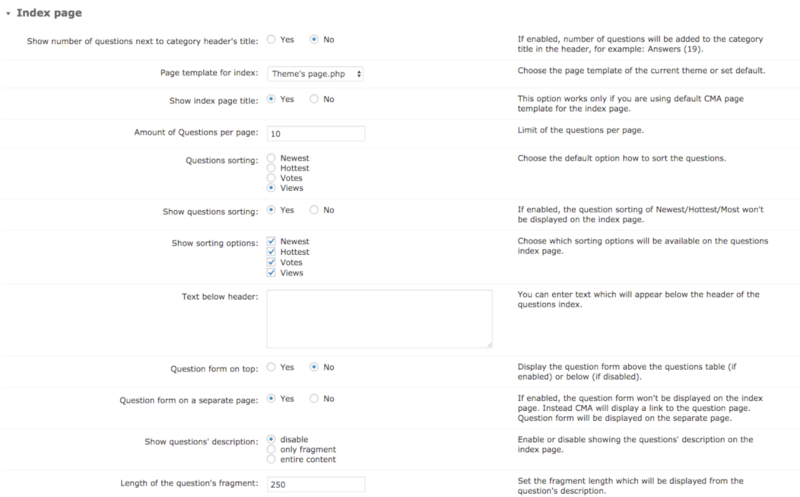 Private Answers – Support posting answers which only question poster and user can see. Private Questions – Support Asking question poster private questions. 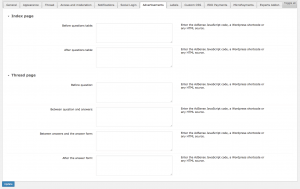 Shortcodes – Use a shortcode to embed questions and answers in your discussion forum to any page or post. 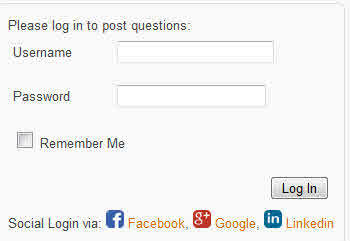 Social media Login – Users can login with their social media accounts to post questions or answers. 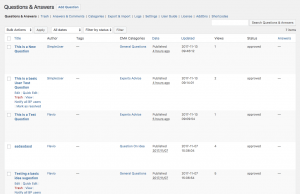 User Dashboard – Users can view their public profiles, along with a list of all the questions and answers they’ve posted. 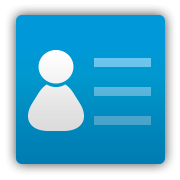 User Gravatar – Displays a Gravatar icon beside each user profile. 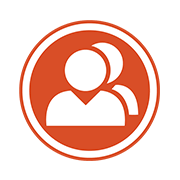 User Profile – Users can view their profiles that contain all their Q&A’s and discussion forum contribution statistics. 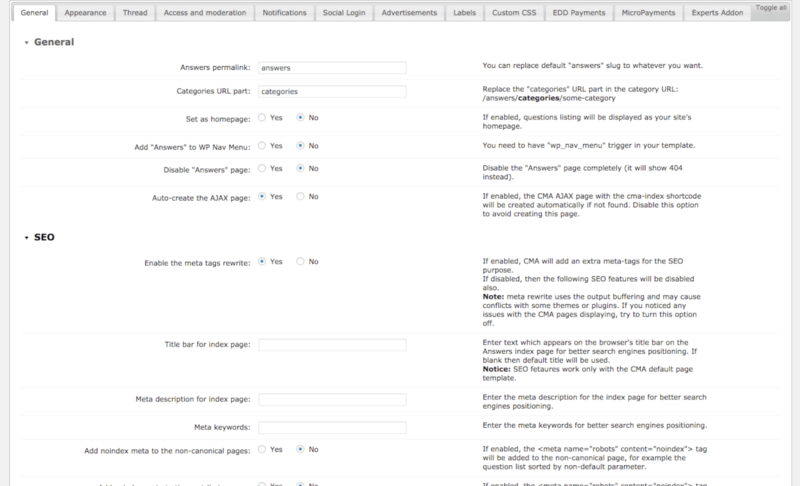 Tags – Tag questions with multiple keywords for searching similar topics on you CM Answers plugin. 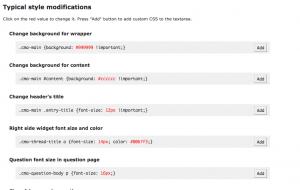 Text Editor – Users can edit their questions or answers with a functional TinyMCE text editor. 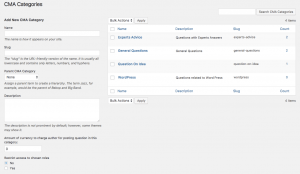 WordPress Comments Integration – Replaces the WP comments system with a Q&A widget on each page or post. 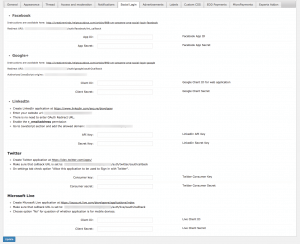 WordPress Multisite – Compatible with WordPress multisite functionality. 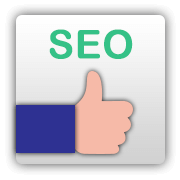 SEO features – The WordPress Answers plugin is SEO friendly and includes support for SEO meta descriptions in the index page and automatically adds the meta description to the answer thread page. 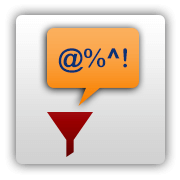 Bad words filter – Create a bad words filter, blocking users from publishing inappropriate content to the board. 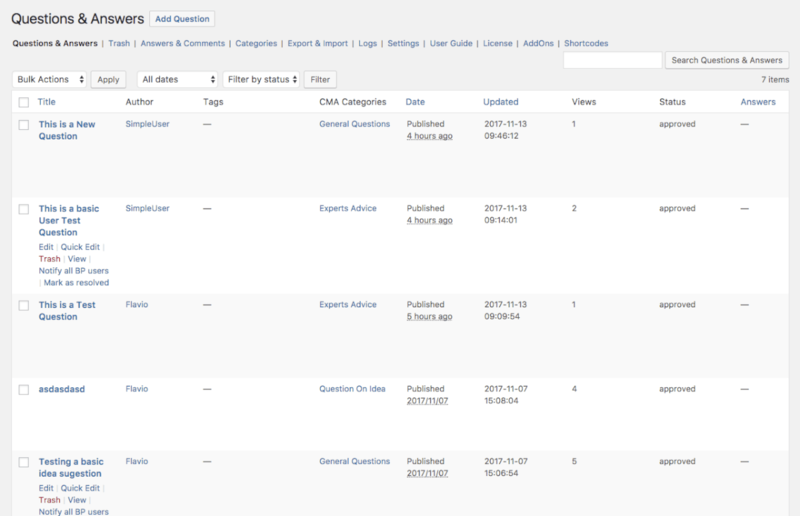 Watch the video clips below to see each Q&A Forum Plugin feature in action, or try them out yourself on our demo site! 1. 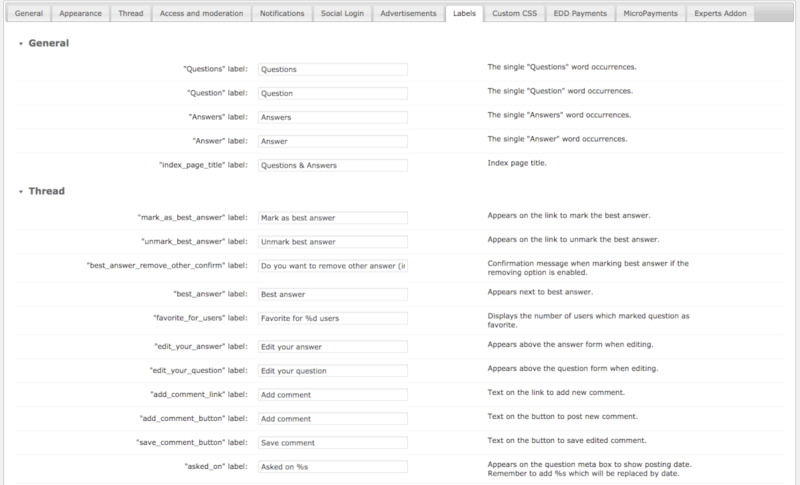 Admin can set up email notifications in the plugin setting to receive alerts on new questions. It is easy to get cynical about customer support. So when we approached CM about the possibility of fixing a rival product to CM Answers that had started to conflict with CM Glossary Pro + you can imagine we didn’t expect much of a response. But CM not only fixed the conflict, they also gave us the tools to make some alterations to CM Answers so that we are now in a position to compare an enhanced CMA with its fully operational competitor. I, for one, am now sold on the idea that CM Answers is the most sophisticated option out there with a support team that truly goes the extra mile. Thank you. I use the pro version of the plugin.I got fantastic customer service, and great turnaround on a small issue that I had. Sorted quickly and professionally. Exactly within 24hrs as stated on the support page.Keep up the good work! I like all your plugins and the support a lot.Thank you . This plugin is full of options (some times too much) It’s very useful to permit your guest to download contents and add comments. Very good support. I couldn’t be happier with the CM QA plugin. Not only is it the best in it’s category the real bonus is the development team and support that are top notch. I highly recommend CM Answers. This plugin is 100%, everything works just fine. I had an issue with adding categories but thanks to the timely response I got from their support team. Nice! Good plug-in ! I use the pro version, which allows lots of functions. Support team is very reactive and cool ! This is a good “question and answer” plugin. It works as advertised. Also, I had a support issue with the registration that was addressed very fast, and they fixed the problem very quickly. CMAnswers provided me with a good question and answer forum out of the box. 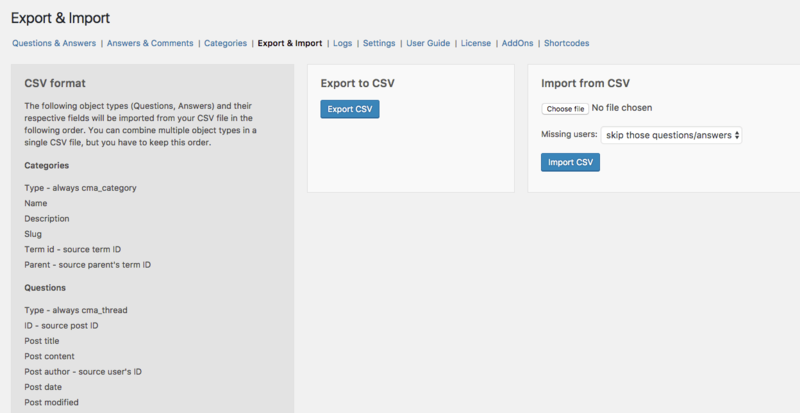 I am using the pro version for the most flexibility on the back end, and so that I can receive CM Answers support. Their support is prompt and usually very good, with thorough and considered responses.The front end of it isn’t as pretty as I wished it were by default, so I’ll be putting in some work to improve the user interface in ways I can’t through the settings. I’m using this plugin now, and got myself the CM Tooltip glossary pro+, too.Very quick support, very cool plugins … hightly recommended. Plugin is working fine. Excellent support team. Quick help is always available. I can highly recommend this plugin for professional use. Great little plugin to that help make a stack overflow style website, i use the paid for version to enable tech support and found that they are extremely fast to response and are very helpful. I really cannot say enough about the support. I have honestly never experienced such helpful people. WOW. 10/10 will definitely do business with these guys again. 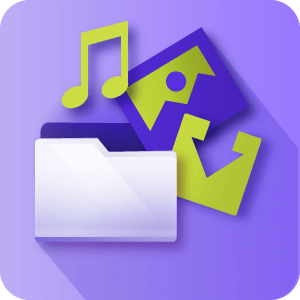 I use the Pro version and I am very happy with this plugin and with its very fast support team. I have requestet a feature and they implemented it in the next release version!ThanksP.S. I really can not understand the one star ratings. Good plugins cost money. Nothing good is free on this earth. There is a lot work beside … every work should be paid!!! This is a great plugin, which I really like. I had a few minor issues with the layout due to the theme, and the Creative Minds Team were fantastic, very quick, and very helpful 😀Thanks!! Plugin works well for me. I had an issue with upgrading from the free version but support was excellent and fixed it for me. Support was prompt and professional. CM Answers is perfect for me! I was so happy to discover CM Answers it really has made my life that much easier. 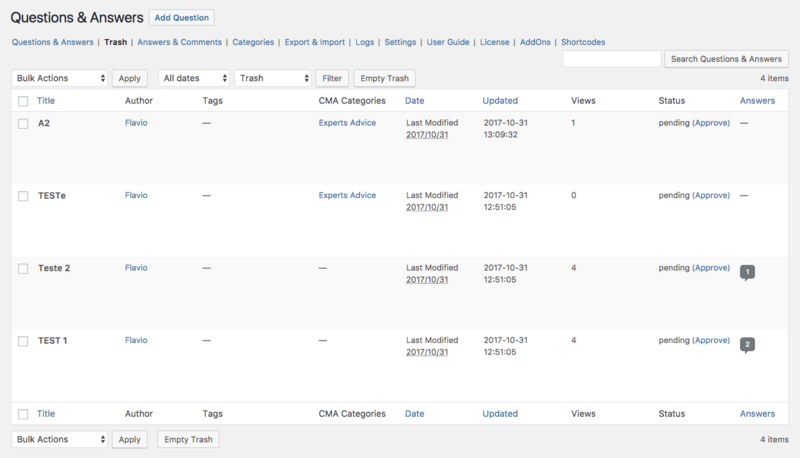 I have a blog and everyone enjoys to post answers.By having CM Answers, I am able to keep everything organized without all the hassle. 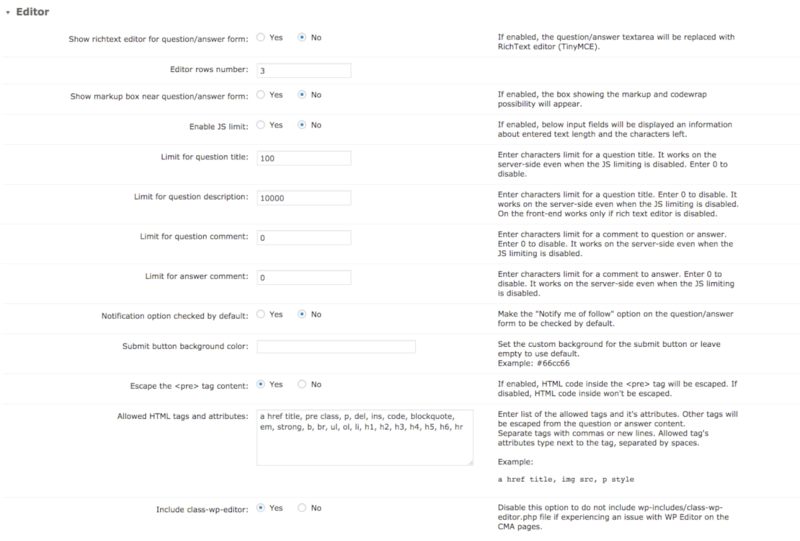 Users are able to answer questions in a stackoverflow style. My blog is staying more organized and the users seem to like the layout better too.The plugin was so easy to install. I installed it quickly and there were no problems. I also am in love with the social media incorporation. Users are able to sign in through social media, which makes things easier for them too. This plugin has saved me a lot of time and energy. I love being able to stay organized and on top of things. This plugin has allowed for me to do just that! I love having all of our community members being able to post questions and reply to other members on our website rather then on Facebook. It helped us promote involvement and discuss issues that are important for our community. I absolutely love CM Answers! I discovered this plugin by accident, and just had to get it. I have a WordPress blog where users write in questions and other users are able to answer them. I have been doing everything manually for the past few months, and I’m so mad at myself that I didn’t discover CM Answers sooner.Easy to download and install, plus it contains no bugs. Everything works flawlessly! 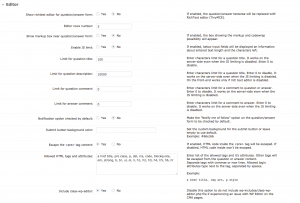 What I like most about it is, it allows the users to post questions and answers in a well organized, Stackoverflow format. Love the incorporation of social media login as well; since everyone uses social media these days! Makes the registration process for my users super easy and convenient.Also love the ability to customize it, so I can change up the styles every once in awhile to give my users a fresh feel. Overall, very happy with this plugin and just wish I knew about it sooner! This is a great plugin with great features. I had a little trouble with the compatibility of my theme. The developer was very helpful and even fixed the issues. Great plugin great developer I highly recommend this plugin. I believe that this plug in is what I needed in a long time. I just started to use it and it seems really user friendly by now. I totally recommend it. I’ve been using the plugin for 1 month already and I couldn’t be more satisfied with it. Really easy to install and to use it afterwards. I definitely recommend it to anybody looking for a discussion board for their blog. I am using this plugin and I am very satisfied with it. I recommend it, you should try it. Enjoy! It’s a great plugin… Awesome. added it to all my sitesreal professional code.not like other Plugins that are out there.will look for more Plugins from same developer. Great plugin and very good support by the developer. Prompt response by email and all issues were investigated and resolved. I got a lot of compliments from my clients for installing this plugin on their sites. They all reported saving a lot of time managing questions and answers, and being able to serve the users much more efficiently and with high satisfaction level.There were some comments for things that can be improved, and the support team was very responsive, so I hope to see improvements soon! 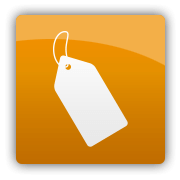 in any case, the paid version is pretty cheap and gives the best value for product that I found out there.Give it a try and you’ll see. I enjoyed the usability of the plugin. Can you please add the ability for the author to edit his question? Thanks a lot! I had a problem with the theme and I received excellent support from CM. They helped me solve the problem immediately and professionally! I hope CM will continue to add more features to this plugin. 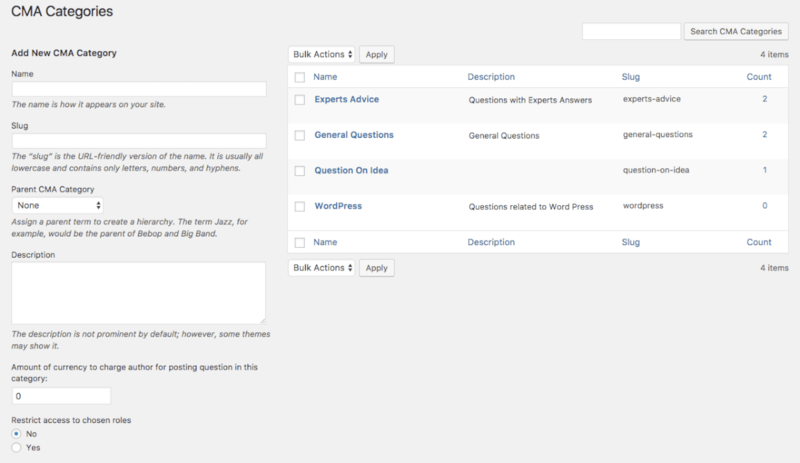 I liked how this plugin puts a forum on the bottom of your page with the submitted answers right below my questions. Users’ comments are easily managed and rated according to most votes or newest. Easy to use interface instantly created a discussion forum on my website. I can manage the questions that are asked and also moderate the answers. Fully functional with social media login and follow-up answer notifications. Worked like a charm with no problems, thanks CM! 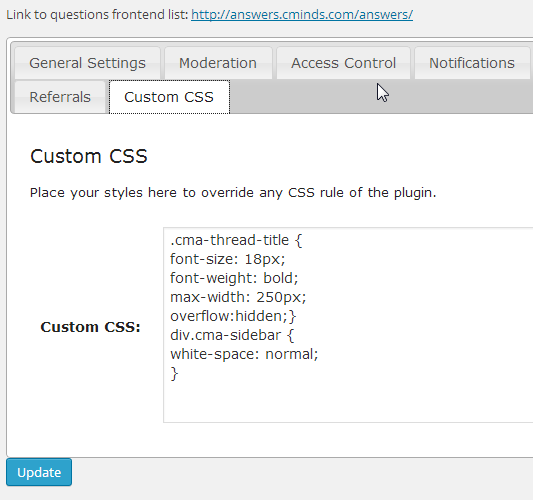 I was very happy to discover this plugin and moreover to get familiar with Cminds.The plugin is a very good platform for question and answers system, exactly what I was looking for.I got great support about all functionality I needed and couldn’t find in other plugins.Thank you very much! For someone who’s completely new to WordPress, there was a bit of learning curve. But support for the Pro product is excellent. I was able to customize it quickly. Thanks for such a great product! Superb plugin and a very good support by the dev. Thx. Great plugin thansk for it! Thank you very much for developing this plugin. It’s very helpful and very good idea. Keep up the good work! 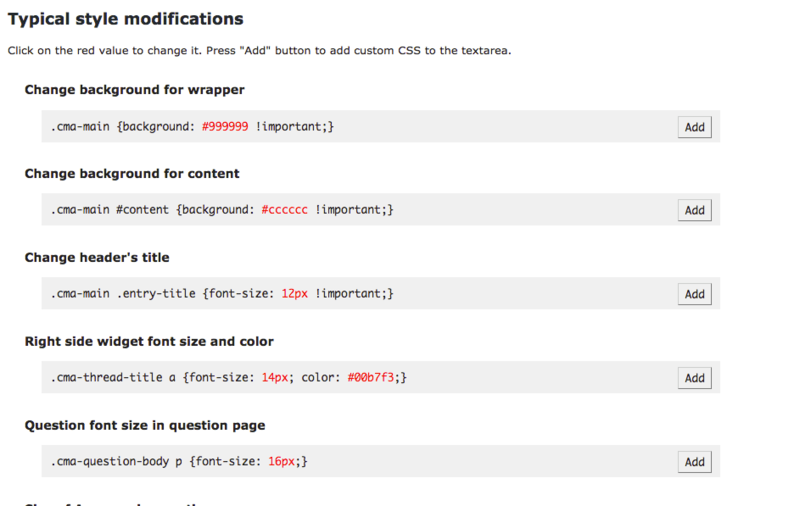 Awesome plugin from awesome and helpful developer. I just got the Pro version and I must admitt it’s awesome. I’ve had some minor problems but the support is very helpful. The plugin works exactly as expected. everything works. good job. thanks. Even I use the free version of the plugin, it’s working great with some minor problems which can be due to plugin conflicts or what so ever. This plugin is great. Make sure to get the PRO version because it has a lot of great stuff with it.Thx! for an awesome plugin I was searching for. Great plugin from great developer! Very good plugin, with a very good support by the creator. Answer by email the same or next day when we have problem, bugs corrected asap, tanks a lot for all of that! Congratulations for your very good plugin. The free version is better than other paid plug-ins. And the plugin owner is very reactive. He fixed quickly all the little bugs we pointed out. Keep going. 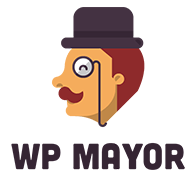 WP Mayor: "CM Answers plugin reviews by WP Mayor - CM Answers is the best way for managing all your user’s questions and answers with this easy to use website discussion forum plugin. With CM Answers you can start moderating discussions right away, and have users login easily with their existing social media profiles. It’s so easy to use, you’ll wonder why you haven’t done this already!." 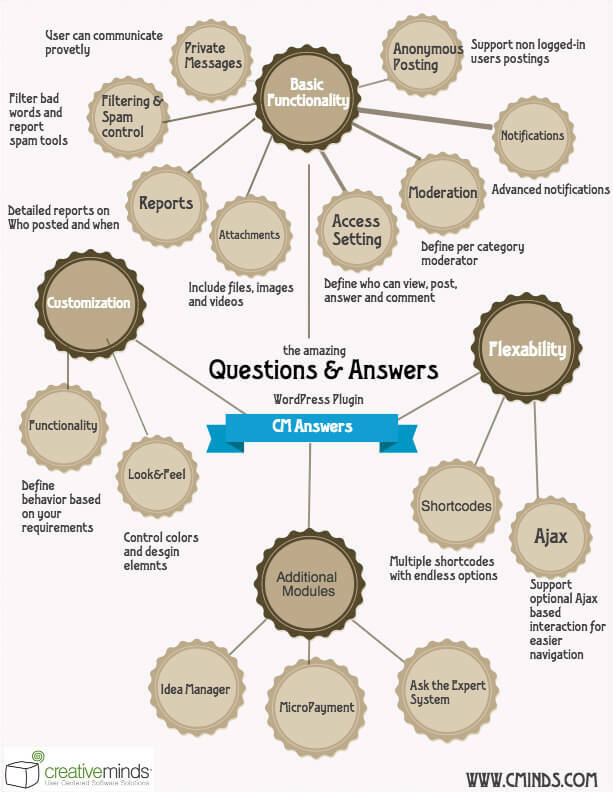 WP Insite: "CM Answers plugin reviews by WP Insite - Gone are the days of the simple bland style discussion board forums. 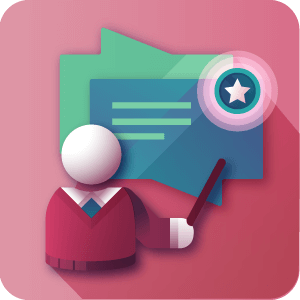 CM Answers Pro is the new way to stylishly display your discussion boards." 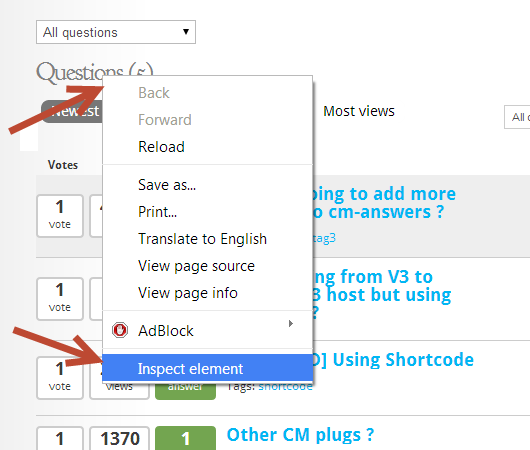 WP Explorer: "CM Answers plugin reviews by WP Explorer - CM Answers plugin integrates well with WordPress and gives both administrators and users a simple way to interact. 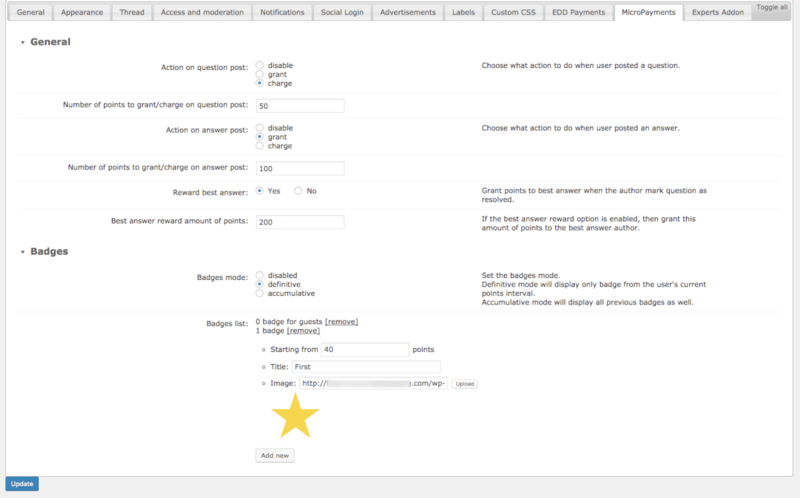 Admins will find customizing the forum a simple process that can be modified on a whim. 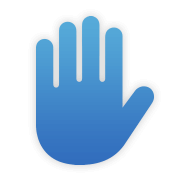 Users will find the end experience to be pleasant to look at and simple to contribute to."